Place your longer clubs toward the back, and shorter ones toward the front. Because pace of play is so important, you should organize your golf club bag to facilitate quick retrieval and return of all clubs and accessories that you use on the course. There are two types of golf club bags: carry (you carry yourself when walking) and cart (carried by the golf cart when you ride). These steps describe organization of a cart bag. A cart bag has a front, where the hand-carry handle is, and a back. When placed on a cart, the front is positioned facing you as you stand behind the cart. Organize the clubs by type and number. Most cart bags come divided into four sections: single at back, double in center and single at front. Place the tallest clubs at the back and the shortest at the front so that the club heads waterfall toward you, making it is easy to see all club heads as you face your bag. Store your woods and long irons (1 to 3) and ball retriever (if you carry one) in the back compartment, your middle irons (4 to 6) in the left-center section and your short irons (7 to 9) in the right-center section. 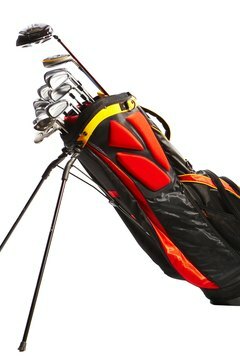 In the front section, store the wedges and putter (unless the bag has a separate sleeve for the putter). The rules allow a maximum of 14 clubs, so you won't have all the available clubs in your bag and may need to adjust this advice accordingly. Check your bag's configuration. Some cart bags are set up with 15 individual sections for 14 clubs and a ball retriever. If this is your bag's design, start at the back with the longest club (your driver or 3-wood) and place the rest of your clubs in the remaining slots in descending order, using the left and right halves of the bag for the odd- and even-numbered clubs. Place your putter in the front-most section (unless a separate sleeve is provided) and your ball retriever (if you carry one) in the center section. Place your umbrella (if you carry one) in the sleeve normally provided on the side of the bag for this. The sleeve is open at top and bottom (for drainage) with a loop at the bottom to receive the umbrella tip and secure it in place. Use the top and front (most accessible) side pockets to store the most frequently used items (tees, spare balls, ball markers and divot repair tools). Use the less-accessible pockets to store occasional use items (rules book, spare golf gloves, sunglasses, suntan lotion, insect repellent, snacks, mints, cough drops). Use the least accessible pockets for the least used items (bag top cover, rain parka, first-aid kit, car keys, valuables). Herm Otto is an architect and was a university instructor for over 25 years. He is also an avid golfer who began golfing 10 years ago. As a Demand Studios writer, Otto writes golf and travel articles for GolfLink. He now resides in Arizona.